InfoUsurpa brings you this weeks events happening in London’s autonomous spaces and beyond. click here to get a proper file where you can actually see whats on the picture!! Opening days at the moment are: Sunday 12-6pm, Monday 12-6pm, Tuesday 12-8pm. 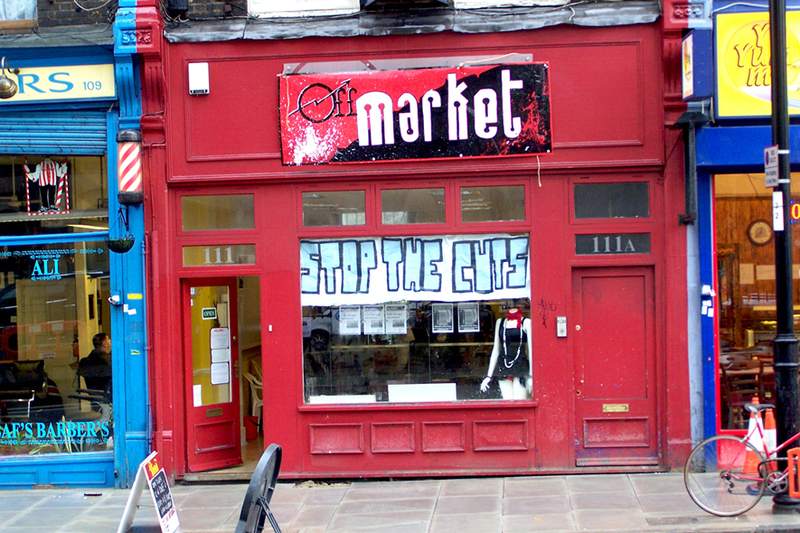 OffMarket open meetings are on Monday 7pm if you want to meet us, check the space out or have any proposal to use the space! January 26th is “Australia Day” – the nation’s annual public holiday to commemorate the founding of the white australian state. Anyone interested in questioning the celebration of the founding and maintenance of a nation through policies of genocide and dispossession, and in hearing about aboriginal resistance to the australian government’s most recent racist laws is invited to this Invasion Day event. We will be screening the… newly released documentary “Our Generation” (see below), giving updates from the Rollback the Intervention and Stop Black Deaths in Custody campaigns and facilitating discussion on solidarity and strategy. 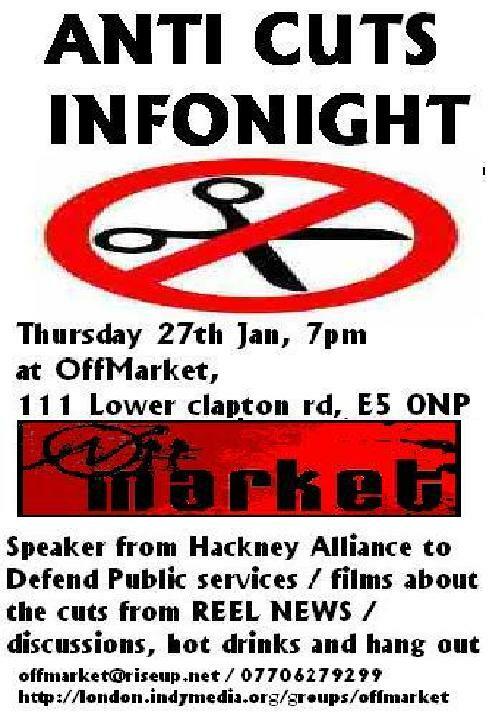 An evening of information, talks, discussions and movies about the cuts and the resistance against them. There will be a speaker from the Hackney Alliance to Defend Public Services, some movies from Reel News, and general cosyness around hot drinks and sofas. Race Revolt started in 2007 as an intervention into the silences around race in the queer, feminist and activist communities. This reading series considers texts that address the ways in which gay rights are being used in nationalist, anti-immigrant and anti-Muslim rhetoric by racist organisations such as the English Defence League, politicians like Geert Wilders and even increasingly by gay activists. This is a reading group, so contact londonreading@racerevolt.org.uk to get the texts that will be discussed. Counter Olympics Network Meeting (see http://www.counterolympicsnetwork.wordpress.com). We, the OffMarket collective, take disused buildings and turn them into open resources. We have just moved in to 111 Lower Clapton Road E5 ONP. This space has been empty for more than a year now. Yes, we occupy buildings that don’t ‘belong’ to us. Rents in London are extortionate, bills are prohibitive, Council housing lists are endless, some are sleeping rough and there are still more than 82,000 empty houses in London! While big owners are letting building rot empty to speculate, we simply claim that everyone should have a decent home! There are lots of ideas about what to do with this space! 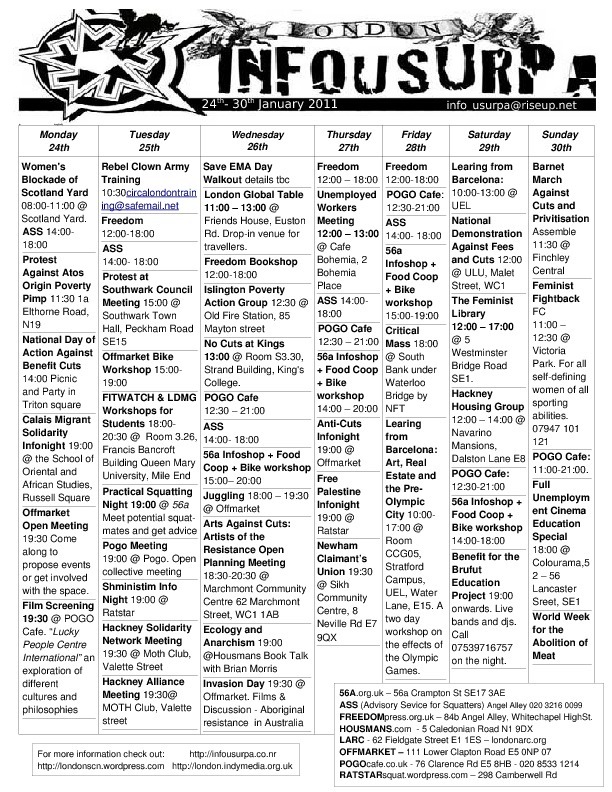 One is to initially try and link to local and broader struggles that are happening in Hackney around issues like the coming cuts, housing, employment, gentrification, supermarket invasion etc. There will also be a FreeZone, where you can bring what you don’t need any more and take what you need ; an InfoLibrary with literature available about various political subjects ; promoting and defending squatting ; skill-sharing etc. It would be lovely to hear from you and what you would like to see happening in a space like this. For now and in the future, we are open to your comments and feedback (or complaint!) about what we are doing. The space will officially open on Friday 7th January from 12noon. Come and visit the FreeZone, the library and the info on squatting. From 6pm, we’ll have some hot drinks and movies. Everyone welcome!